This melody and its lyrics are connected to a story about Wang Zhaojun, later known as one of China's "four beauties". According to the story, while she was a concubine in the palace of Han emperor Yuan (Han Yuandi; r. 48 - 32 BC), because she did not bribe the court painter, she ended up being sold to a foreign prince and having to spend the rest of her life in the wastelands of Central Asia. The melody here is related to the one on this theme called Longshuo Cao in Shen Qi Mi Pu (1425), and versions of this melody survive in at least 17 handbooks from 1425 to 1618.4 Theoretically, a song version such as this could have been the earliest one, but the publication date of 1511 for the current version suggests it was done by some person or persons inspired by the 1425 melody, who decided to arrange parts of it according to pre-existing lyrics. Structurally this piece has 13 unnumbered sections. The seventh through twelfth sections have basically the same lyrics and music as the first through sixth sections, with sections seven through ten an octave higher (except for open notes), the others almost exactly the same. The 13th section is in the form of a coda or separate short song. All sections have lyrics throughout. Although Taigu Yiyin mentions only Wang Zhaojun in its attribution of the melody, the lyrics are by (or attributed to) seven different poets, only the first being attributed to Zhaojun herself. These lyrics appear in the same order as they do in Folio 59, #1 of the Yuefu Shiji.5 There they are attributed to, in order, Wang Zhaojun herself, Wang Shuying nee Liu (sister of Liu Xiaochuo), Chen Shubao, Bai Juyi, Zhang Hu, Liang Shiqiong and Yang Ling.6 Following the musical structure just described, the first six poems are set to the first six sections of the music, then repeated in the next six sections, with the same music though perhaps in a different octave; then the lyrics of the seventh poem are applied to the 13th section. Although the melody following this in Taigu Yiyin is called Yellow Bell Mode (Huangzhong Diao), a name for the tuning used here, there is in fact no connection between the two (details). For more information see comments on the version published in Shen Qi Mi Pu (1425), called Longshuo Cao. Translation from Paul Rouzer, Articulated Ladies, pp. 183-4. Their leaves grow sere and yellow. Nesting in the clumps of mulberry. Form and features glow with light. Where they attend within the curtains. My body is broken and buried. My will sunken and desolate. My heart stumbles and hesitates. I've departed, changed from the norm. Gather far away among the Western Qiang. Lofty hills, so steep and tall! Yellow River, how it flows and floods! The road is far and long! My worrying heart is sad and broken. Translation from Red Brush, p. 149. How can one settle one's life once and for all? It is impossible to know what will befall. The mirror-case became a withered weed. Have continued to fall and still not dry. Please be so good as to tell this to everyone. Joltingly betrothed into the Khan's palace. appropriate to imperial quarters in accord four stars (in north, east, south and west). a thousand mountains along the road bring hardship. 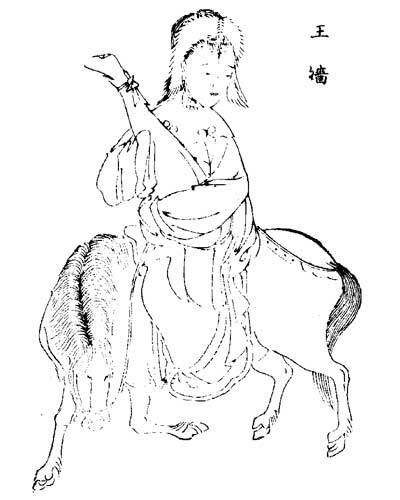 The nomad winds neigh while going past horses, the Han moon mourns while going through its cycle. on horseback playing winds and strings headed to Yin Mountain. she is embarrassed for the Khan to see the reflection of her old face. See Zha Guide 7/73/113 and Longshuo Cao. Taigu Yiyin does not mention tuning or modes, so this information must be determined by internal analysis or comparison with related versions. Here the tuning is clearly Wuyi, also called Huangzhong (Yellow Bell). To achieve this tuning, from standard tuning slacken 1st, tighten 5th strings each a half step. For more details on this mode see Shenpin Wuyi Yi. For more on modes in general see Modality in Early Ming Qin Tablature. The connection with the old Huangzhong Mode makes it seem likely that it is not a coincidence that the following melody is called Yellow Bell Mode (Huangzhong Diao). However, there is in fact no discernible connection, either in tuning, mode or lyrics. Image of 王嬙 Wang Qiang (Wang Zhaojun) from 陸昶輯，歷朝名媛詩詞﹕十二卷 (Lu Chang, editor, Li chao ming yuan shi ci, 12 folios), 1772. As can be seen from this chart, a completely new melody on this theme was published in 1689. Melodies after this, whether called Longshuo Cao, Zhaojun Yuan or (most popular today) Longxiang Cao, are all related to this later melody. These are outlined below under Music. Folio 29 of YFSJ also has poems on the Wang Zhaojun theme, including one by Guo Yuanzhen (p.429). However, there seem be no surviving settings of these for qin. In addition to ther 1491 lyrics, see also 怨曠思惟歌 Yuankuang Siwei Ge [Longing in Resentment and Loneliness] under the Wang Zhaojun biography, and Yuankuang Siwei Ge in Qin Cao, Hejian Zage #21. YFSJ seems to have 35 poems/poem sets by 陳後主 Chen Houzhu: Chen Shubao, who reigned from 583-589 as the last emperor of the Chen dynasty, hence 陳後主 Chen Houzhu (Last Lord of Chen, generally considered his reign title). After the establishment of the Sui dynasty in 589 the Sui emperor treated him well. He is said to have been an incompetent ruler more interested in wine, women and song (or poetry) than in ruling. Minford, p. 562, says, "His is 'palace-style' poetry of the most languid type." This is perhaps exemplified by his Jade Trees and Flowers in the Rear Quarters (玉樹後庭花 Yushu Houting Hua, aka Jade Arbor and Flower in the Bower, YFAJ 47/680). During the Tang dynasty the censor 杜淹 Du Yan pointed to songs such as this in warning the Taizong Emperor of music that showed empires in decline; Taizong retorted that if the empire was well governed then sad songs could not undermine it.